It was good to welcome pupils from Waterloo Primary School to Bootle Town Hall. We have a well organised tour for young people including a quiz and a question and answer session. The pupils were drawn from the School Council, Eco champions and anti-bullying leads. I always find that primary school youngsters are the most inquisitive. They ask the questions that come into their head. This makes for a much more interesting and challenging time. As part of the quiz they have to identify things in the Council Chamber. To their credit this group out performed the question setter. When asked to identify all the birds in the room they noticed a whimbrel -one of our coastal wading birds -that we had missed !.And when they were looking for bees they noticed one on the stain glass window with the Burnley Coat of Arms that had also been missed. 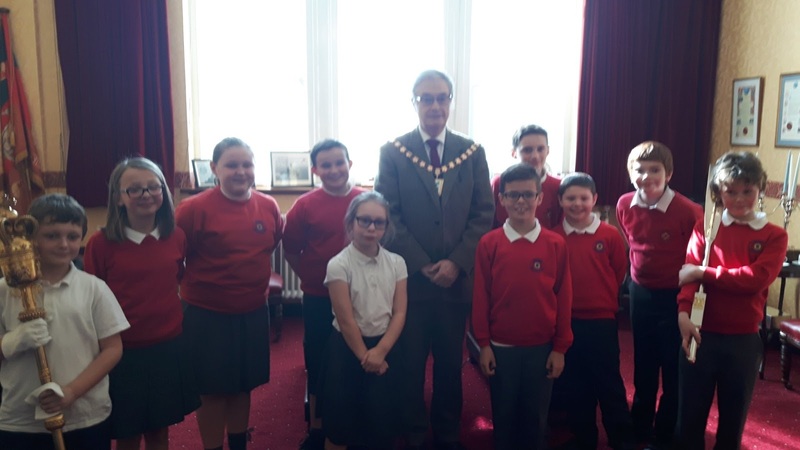 After the tour of the council chamber we went into the Mayor's Parlour and the Mayoress's dining room and the pupils had the chance to dress up in Mayoral robes and ask lots of questions about the Maces and the moyoral chains. In the picture one of the pupils is carrying the Mace used by the former Crosby Council and another the silver oar presented by the Mersey Docks and Harbour Board the Bootle County Borough.